Having spent ages escaping the uncertainties of nature in the development of a civilization, many of us find we are no longer completely comfortable in a completely natural environment. Nor are we completely comfortable in a completely artificial environment. When we can wed the two—creating a civilized space endowed with natural elements or a natural space that easily accommodates our wonted uses—we are happiest. 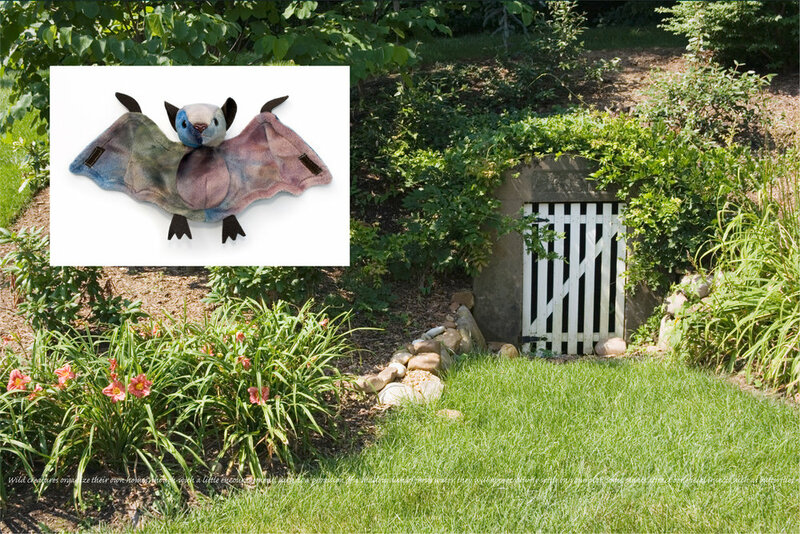 Flora and Fauna combines photographs of suburban front yards and of stuffed animals, insects, and birds to examine our society’s anxious relationship with the natural world. The untamed wilderness makes us uneasy, but with a tape measure, shovel, and pruning sheers, our quarter acre plot of earth can be transformed into a neatly organized formal garden, terraced woodland, or potted jungle. This body of work identifies a local variety of the attempt to control nature. The project consists of digitally-composed archival pigment prints on Hahnemuhle Photo Rag paper. Photographs of manicured lawns, shaped hedges, cultivated flowerbeds, and stone-rimmed water features attest to the homeowner’s manipulation of natural elements in order to produce garden sanctuaries. Stuffed raccoons, nut-cracking squirrels, and tie-dyed bats evidence a desire to contain troublesome or scary creatures that threaten to disrupt one’s domestic security. Printed across each photograph, quotations from gardening guidebooks provide clear instruction for the design and reconstruction of the natural world. Romanticized, feared, and radio-collared, the natural world is more threatened by humankind than we are by it. Flora and Fauna seeks to depict a central issue of our age—humanities’ troubled relationship with the environment—in a manner that is whimsical and non-confrontational yet analytic. 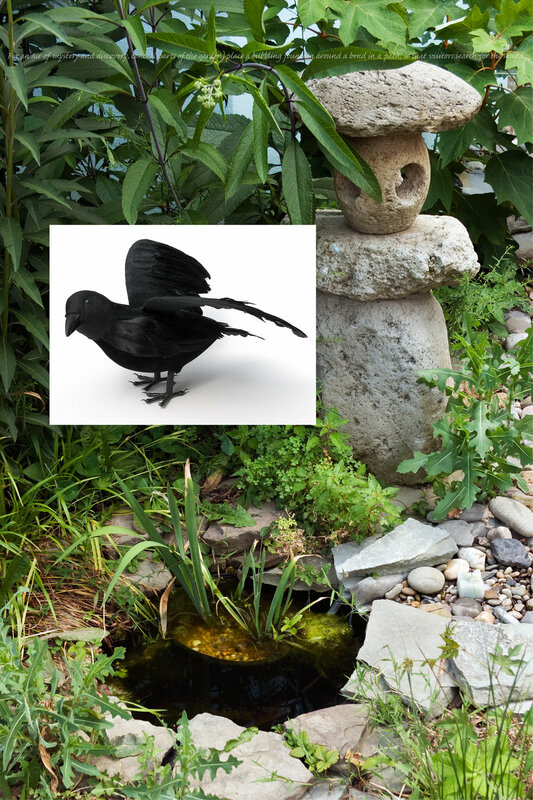 Crow: For an air of mystery and discovery, conceal parts of the garden; place a bubbling fountain around a bend in a path, so that visitors search for the sound. Bee: … a need to enclose space around the periphery of the garden or around certain areas within it. This may be to define the boundaries, to provide security, to break larger areas into smaller “rooms,” or to block out undesirable views. Frog: A pond can’t be easily moved, so choose your site carefully. Before plopping a pond down in the middle of the backyard, imagine how you might integrate it, visually if not physically, with nearby plantings and structures. Fox: Always carry your pruners into such a garden; snip a little here and a little there, and the garden will never look pruned, never look like it needs pruning, and will always be beautiful. The result is deeply satisfying. Bunny: A simple garden can be pleasurable and quite soothing, but without distinctive visual components, it risks becoming tedious. A bench, a small sculpture, even the placement of a good-sized rock can perform this essential function.